The situation is still tense on the outskirts of Gorlovka. Trench combat takes place in the area of Zheleznaya Balka and Shyrokaya Balka villages. The Ukrainian side uses small arms, automatic grenade launchers and tank gun. Explosions are heard in the north of the city as well. The area of Avdeevka industrial zone and Spartak village in the north of Donetsk and Staromikhailovka and Trudovskie villages in the west were under Ukrainian artillery fire. The enemy also shelled the villages by 152mm artillery, 122mm guns, 82mm and 120mm mortars. Elenovka village on Dokuchaevsk direction was shelled. There was no information regarding casualties and destruction. Sakhanka and Leninskoye in the south of DPR were once again shelled by Ukrainian artillery. DPR recon registers arrival of 12 tanks, ten 122mm howitzers and six 120mm mortars to Skotovataya railroad station near Verkhnetoretskoye township in the area of Gorlovka. A large group of enemy’s militants, presumably mercenaries from Poland and Georgia, is being reported present in Novgorodskoye village (Gorlovka direction). 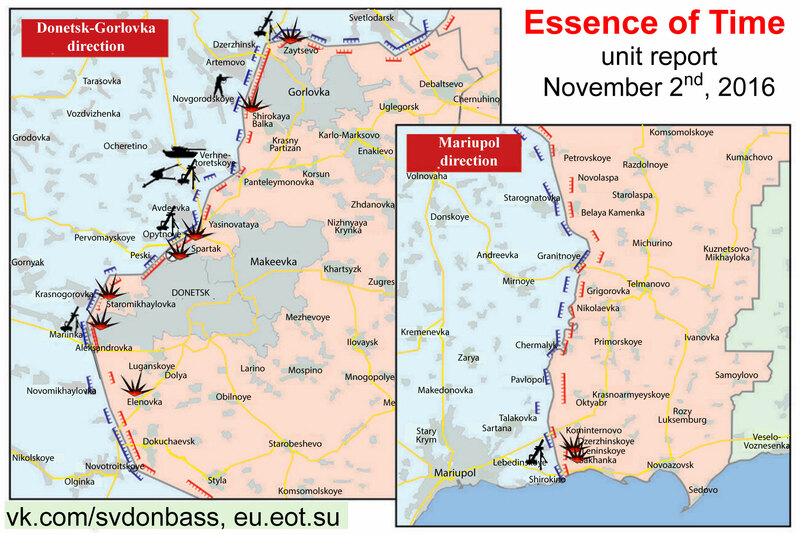 According to updated information, on November 1 Ukrainian militants shelled DPR territory 440 times.